The goal of this trial is to assess whether cannabis medicines can enhance the quality of life for adults with advanced cancer, particularly by improving appetite and appetite-related symptoms. The trial consists of two stages and will play a critical role in helping to answer important questions about safety, efficacy, dosage and frequency, side effects and what the best delivery mode might be for palliative care patients. It is separate to the Medicinal Cannabis Compassionate Use Scheme, administered by the NSW Department of Justice. Led by UNSW Professor Meera Agar in collaboration with researchers from several universities, the first stage of the trial will enrol approximately 30 patients with advanced cancer and take place at Sacred Heart Health Service, St Vincent’s Hospital, Sydney, and Calvary Mater Newcastle hospital. A cannabis flower bud is being used in the first part of the trial. Produced by Bedrocan BV®, a medicinal cannabis company in The Netherlands, this is the first time in Australia that a vaporised cannabis flower bud is being used in a clinical trial to develop a better understanding of how it may provide relief to adult cancer patients in the final stages of life. Participants will be administered varying doses of the vaporised cannabis flower bud (Bedrobinol® 13.5% THC) one hour before meals three times a day for a period of seven days, unless side effects occur. Participants will have blood samples taken at multiple time points up to four hours following each morning dose to determine the concentration of the drug in the blood. They will also be asked to complete questionnaires and a daily food record to monitor the effect on appetite, mood and other factors. This randomised clinical trial aims to determine if a new oral formulation of delta-9-tetrahydrocannabinol (Namisol®) can improve anorexia-related symptoms and concerns in people with advanced cancer compared to placebo. If the patient is still responding to the study treatment at the end of the study (Namisol arm) or had no response (placebo arm), there may be an opportunity to continue with treatment post study. Such provision will be restricted to patients who experience an improvement in anorexia-related symptoms without adverse effects, or those who had no improvement, where it is deemed clinically appropriate to continue/commence treatment. The outcomes of interest are appetite related symptoms and concerns, quality of life, altered taste and smell sensations, relief of other symptoms and side effects. 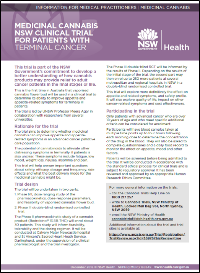 Only patients with advanced cancer who are over 18 years of age and who meet specific additional criteria can be considered for enrolment in either stage of this trial. 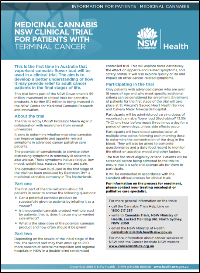 For information on the process for enrolment, patients should contact their treating oncologist or palliative care specialist to discuss the eligibility criteria.